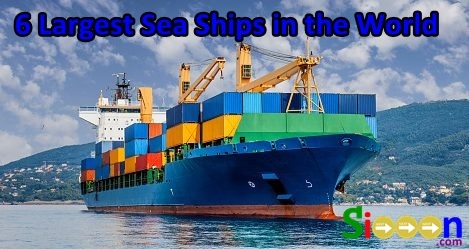 Sea ships are one of the means of transportation that can be used in the sea, used to take people on the road, send goods, and there are also ships that are used for war or just fencing the waters of the national border. Prelude is the largest ship in the world that has been built until now and was first launched in South Korea in December 2013. The length of this ship is around 488 m (1,601 ft) and its width is around 74 m (243 ft). More than 260,000 tons of steel are used in the manufacture. Seawise Giant is usually called Queen of the Seas. This ship was built by Sumitomo Heavy Industries, Ltd. in 1979 in Japan. During the Iran-Iraq War this ship was damaged by an air force attack, until it sank and was considered completely lost. But the wreckage was rescued and repaired. Then the ship was sold to the Indian ship breaker and renamed Mont, its last trip in December 2009. The Pierre Guillaumat ship was a supertanker built by Chantiers de l'Atlantique in Saint-Nazaire in 1977 for the Compagnie Nationale de Navigation. Because of its enormous size, it makes use of Pierre Guillaumat very limited. Pierre Guillaumat's ship's length was around 414.22 m (1,360 ft) and its dead weight was almost 555,000 tons with a speed of around 16 knots. The Batillus ship was a supertanker built in 1976 by Chantiers de l'Atlantique in Saint-Nazaire for the French branch of Shell Oil. This ship has a length of 414.22 m (1,359 feet), dead weight of almost 554,000 tons with a speed of around 16 to 17 knots. Batillus made his last trip on December 28, 1985 from Vestnes to Kaoshiung (Taiwan). Esso Atlantic is basically an oil tanker. This ship has a length of about 406.57 m (1,333.9 feet) with a dead weight of around 516,891 tons. Esso Atlantic was active for almost 35 years and was finally discarded as scrap in 2002 in Pakistan. The Maersk Mc-Kinney Moller ship is the main container ship class of Maersk Triple E. This ship has a length of about 399 meters (1,309 feet) and has a maximum speed of around 23 knots. This ship was built for Maersk by Daewoo Shipbuilding & Marine Engineering (DSME) from South Korea, and began operations in July 2013. That's the biggest ship in the world, most of them are ships carrying containers or goods. This ship is very useful for sending goods between countries or continents, because there are no planes that can carry that much goods. Keyword: Largest Sea Boat, World's Largest Ship, World's Longest Marine Ship, World's Largest Sea Ship, Large Size Marine Ship, World's Biggest Sea Ship, World's Largest Ship Sending Ship, World's Largest Container Carrier .